Battlecry: Add a random Paladin card to your hand. A veteran of a number of crusades, she is a force for light and goodness. Her latest crusade is against goblin telemarketers. This card can give you Uther of the Ebon Blade! This should probably be Discover a Paladin card with the cost. It would make it a bit more consistent and strategic to use. There's too much risk that you'll get a card that is absolutely worthless to your deck and situation right now, relegating this mostly to goofy fun decks. So, they could change it? Those changes may be impossible for a physical card game, but this is a digital card game. I think it would significantly improve the card, and it sounds like a reasonable change to me. Suddenly value as a 6 drop in thief rogue decks! How about this card in spell mage? I find it hilarious reading all the hate on this card and yet it is only included in 0.66% of decks (from overall deck stats). I'm really curious why Blizzard decided to make a card that gives any class cards from a specific class. 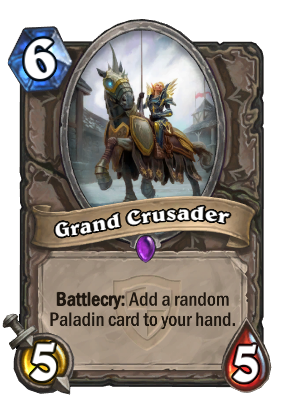 It's like they're admitting Paladin cards are so good that even a random one makes up for -1/-1 in stats. Anyfin Could Happen just nerfed this. Where's my dust Blizzard? I am appreciating this minion more and more. The element of the unexpected from the opponent is just awesome. Sometimes I like RNG and sometimes I hate it, but he seems to work very well, especially since the Paladin's cards are so good. He can be used possibly even in the place of Sylvanas Windrunner, who unfortunately is not working as well as she used to in the past (small minions and board flood sometimes make her too slow or even completely useless). A solid body too, and a very good fit in midrange / fatigue decks that THANKFULLY are coming back due to Reno Jackson. Excellent job, Blizzard. No es una gran carta, pero con su inclusión en el Casino Mage, puede ser uno de los tapados que luego sorprenden de TGT. I know the consensus is this card is bad and too RNG. But I actually like it for control war. It's good for those long control matches, with the 1/30 chance to draw a Tyrion! i feel this card is a bit to unpredictable to be used in decks other than paladin. the bonus is that you do not have to wait till turn 8 to get your card if this was inspire or pray that your opponent doesn't murder it if you played outright. the bonus card could be good but i feel that since with all the expansions we have now that the unpredictability that it has makes it just too hard to use in anything other than paladin. The Paladin value is real. I switched two days ago this Card for Sylvanas out of my midrange controlish Pally-deck,and i dont regret it! Just drew the third Equality from her wich got me to Legend! Even if i draw lowspell cards they are impactfull enough somehow in the lategame. A good card ,nothing OverPowered but good enough until Pally gets an other six drop(or you stick with Sylvana ).